Angelyn Bass is an architectural conservator specializing in the conservation and management of archaeological and historic sites. 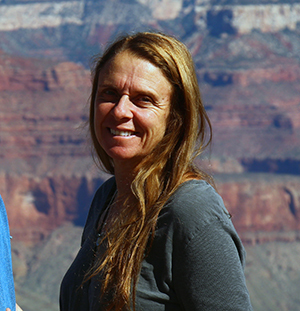 Angelyn joined the Department of Anthropology in 2013 as a visiting Research Assistant Professor, and is the PI on multiple interdisciplinary field study projects funded by the National Park Service and administered through the Colorado Plateau Cooperative Ecosystem Study Unit. Angelyn’s current research at UNM focuses on the characterization and analysis of ancient earthen building materials (especially plasters) in the American Southwest. These comparative studies rely heavily on instrumental analysis of plaster microstructure and microcomposition, combined with field observation and architectural survey to provide insight into ancient building technologies, materials sourcing, methods of plaster production, and history of building use. Instrumental analyses, conducted in collaboration with Mike Spilde (Institute of Meteoritics), include optical microscopy, X-ray diffraction, SEM-EDS, and image analysis of micrographs. Results from these studies suggest that earthen materials were purposefully selected and processed to create finishes of varying performance characteristics and visual qualities. The research has allowed Angelyn’s team to expand archaeological analyses at several sites to better understand craft practices, use-history, site significance; assess the physical conditions and state of preservation of buildings more accurately, identify types and extent of deterioration and its causes, and; develop repair materials that address the loss of ancient materials. 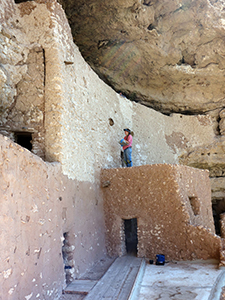 In addition to building materials characterization, Angelyn’s team partnered with colleagues at the University of Vermont, MIT and Cambridge University to conduct first-order structural evaluations at Casa Grande and Montezuma Castle. The investigations identified at-risk wall segments most vulnerable to lateral loading by using LiDAR data, discrete element modeling and dynamic analyses, to evaluate fragile walls. Currently, Angelyn is including students in conservation projects at Casa Grande Ruins, Montezuma Castle, and El Morro National Monuments, and will start new projects at Tonto and Canyon de Chelly National Monuments in the fall of 2018. UNM students have also been involved in Angelyn’s work in wall paintings conservation at the ancient Maya sites of San Bartolo and Xultun in the Peten, Guatemala. 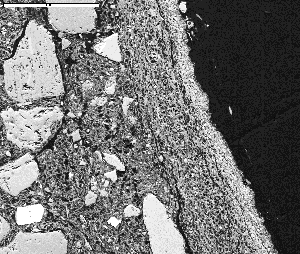 (Photo below: BSE-SEM image of Casa Grande earthen finishes showing fine-grained, clay- and gypsum-based washes that were consistently applied in thin layers, generally ≤1 mm thick, over the plaster substrate. The very dense but thin calcium sulfate-rich layer (gypsum) also contains a distinctive calcium phosphate component that comes from adding ash and bone to the wash, which distinguish it from plasters found at most Southwestern sites from the same time period. (scale bar = 100 microns). 2017. Bass, Angelyn, Porter, Douglas, Spilde, Mike, Guebard, Matthew, Shaum, Katherine, and Ferriola, Nicholas “Characterization and Comparative Analysis of Ancient Earthen Plasters from the American Southwest.” MRS Advances, 1-34. Cambridge University Press doi:10.1557/adv.2017.240.